In this post I'm gonna explain how I proceeded step by step so you can create your own patch item. 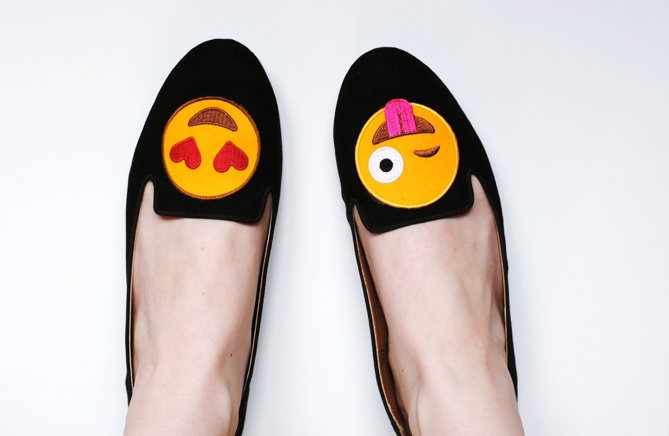 As I was lusting after another trend item of the season, namely smiley loafers, I created some with my leftover patches. You will thus also find the tutorial for these further down in this post. The patch trend can be seen on almost every piece of clothing, but not everything is equally suited for a DIY. If you want to work with iron on patches, you should choose a piece of clothing that can be ironed at high temperatures and that isn't stretch (a denim jacket would be ideal). If you want to sew on the patches yourself you'll wanna choose a piece of clothing with thinner cloth as the patches are quite thick already and you may have problems piercing them with the sewing needle. However I wouldn't choose a plain shirt as the patches may be too heavy for such light cloth. Patches will be sold in more and more clothing stores this season, but they have been available in special stores such as Veritas for ages. You could also try and check on local markets to find some really vintage ones. However the easiest option is to check some Etsy stores as they have a huge choice. 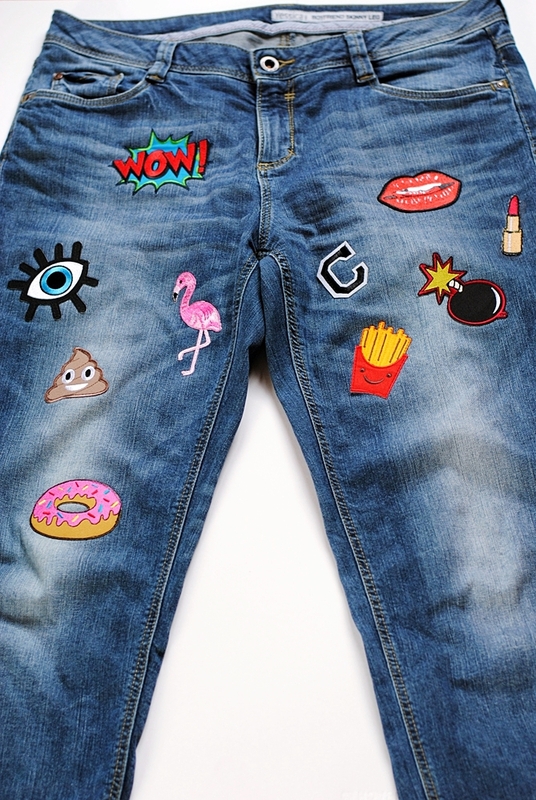 I simply typed 'iron on patch' on Etsy and went through all the different shops. The best seller I could find is definitely 'LikePatches' as they have a huge range, sell all patches for 1,71€, and don't ask much for the shipping. However I also ordered from other sellers as I fell in love with some other patches, too. The only patch that disappointed me was the lipstick patch from 'MiniandVan' as the quality wasn't as good as that of the other patches and it didn't stick at all when I ironed it on. The shipping took about 1-2 weeks from every seller. As you can see I took patches in very different colours which is absolutely cool for this trend. However I wanted to arrange them nicely so I took some time to figure out their final position. Definitely take a photo once you know where to iron the patches on! I would suggest to avoid places where your garment will bend a lot, unless you additionally want to sew the patches. To iron on the patches put your iron on the highest degree (steam turned off!). Lay a thin cloth over the patches to protect them from the heat. Then iron them on with a lot of pressure for a few minutes. Let them cool in straight position and carefully check if the edges stick properly. To iron on all patches I took about one hour so you should plan some time to do this. If you want to make sure your patches stick even after washing them or wearing your DIY a lot, you should fasten them with some additional stitches. As I wanted my DIY to look as good as possible I asked a sewer to help me out with this step. As the patches are mostly made of sewing thread you can get a neat result by simply using the same colour of thread. I am really satisfied with the result of my jeans and I'm glad I decided to additionally sew on the patches so I can be sure they will stick. I was also really surprised by the good quality of the Etsy patches and I would order at most shops at any time again. Buy two (different) patches and a pair of cheap shoes (like the H&M loafers) and glue them on with superglue. Don't apply too much glue so it doesn't stream out underneath the patches. Use some clothespins to hold the patches and let it all dry overnight. This is the method that I used. If you want to change your patches from time to time, you can also buy several patches in the same size and work with Velcro Fastener. In a sewing supplies store you can get self-adhesive velcro fastener which you only have to cut to the size of your patches. 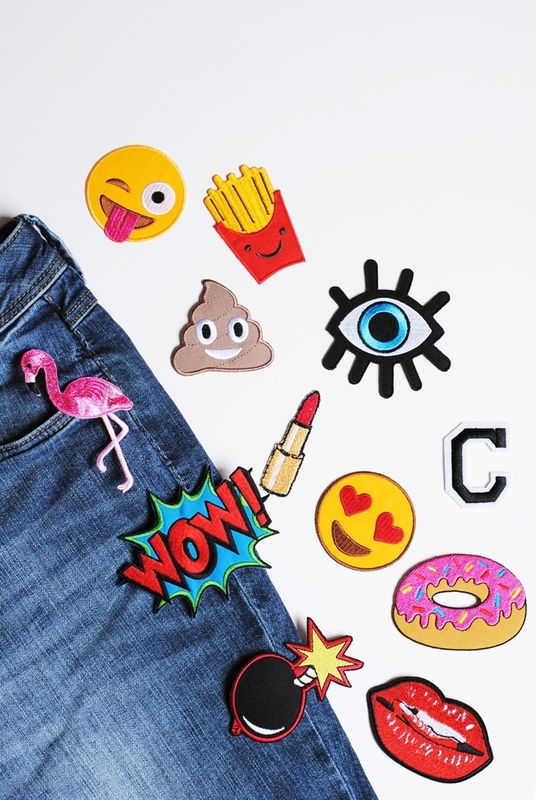 If you apply some to other patches as well, you can easily change your smileys according to your mood or outfit. Are you going to give one of these DIYs a try? If yes I would love to see the result so don't forget to tag me when you post your result on social media and I will share it with my followers, too!